Cut jalapenos in half lengthwise; remove seeds and center membranes (If you do not remove they will be spicy). In a small bowl, combine the cream cheese, cheddar cheese and Cajun seasoning. Stuff about 1-1/2 teaspoonfuls into each pepper half. Cut bacon strips in half widthwise. In a large skillet, cook bacon until partially cooked. 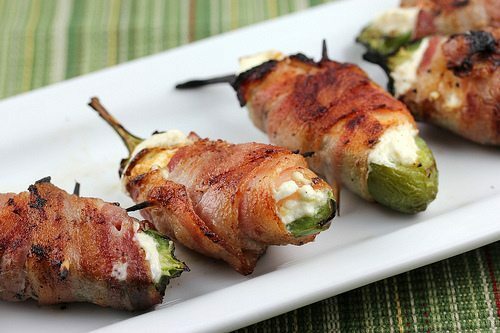 Wrap a bacon piece around each pepper; secure with a toothpick. Place on a wire rack in a shallow baking pan. Bake, uncovered, at 350Â° for 25-30 minutes or until bacon is crisp. Discard toothpicks. Serve immediately. Note: I have used this recipe without the cheddar cheese and without precooking the bacon and they came out perfectly fine, it just takes a little longer for the bacon to get crispy.